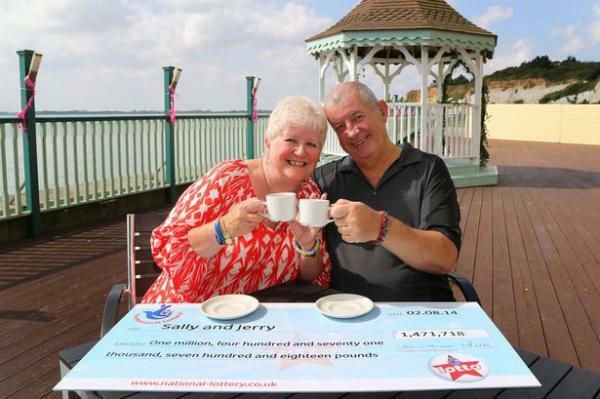 In typical British fashion, retired council worker Sally Ann Wells, found out that one of her lottery tickets had landed her a 1.5 Million jackpot in the UK National Lottery whilst enjoying a cup of tea at her kitchen table. 63-year old Wells, who purchased the tickets with her partner of the last 14 years, Jerry Gregory, felt the need to check her tickets after reading in her local newspaper that a winning ticket had gone unclaimed in her hometown of Ramsgate, Kent. Wells explained to reporters when receiving her prize that she plays 2 tickets every Saturday, one line made up of family birthdays and the other of randomly selected numbers. The mother of two had recently returned from a holiday in France and had about three months’ worth of tickets stuck to her noticeboard to go through and whilst she was happy about winning 25 in July, she couldn’t believe her luck when she realised one of her August tickets had landed her the jackpot. "In fact, when we double-checked the numbers that morning we didn't know how to celebrate, so we went to Tesco and did a food shop. And like we always do, we looked at the special offers." How would you celebrate after seeing you’ve matched all the numbers when checking the lottery results? At GiantLottos, you won’t have to worry about waiting 3 months, we’ll let you know right away! Put us to the test by playing for the monstrous $171 Million USA Powerball this week! You can enjoy lotto on the internet, here at Giant Lottos for the exact price you 'd spend in the stores. Enter using our quick and easy registration process and you'll have the ability to pay in funds, choose your numbers and purchase your lotto tickets online. Yes, internet lotto fans can certainly play EuroMillions on the internet no matter their location! The EuroMillions lottery was first established in February 2004 by three founding lottery providers.